In 1971, three weeks after starting my training in a small dojo in LaCrosse, Wisconsin, USA, Grand Master Trias visited our dojo. 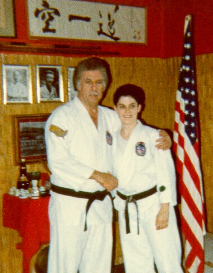 I was twenty years old, already bitten by the karate bug and here was the Grand Master of our style. Like most people of that time I was awe-struck. But Trias Sensei soon taught me to give up the awe and take my place as an equal human being. At a time when so many Western men were becoming higher in rank and were abusing their power positions, Trias Sensei was teaching us to take our place among our fellow karateka and never to act subservient or superior. This was a wild and radical concept at the time and one that has served me well throughout my entire adult life. During this visit Trias Sensei gave me more than twenty hours of private lessons and about ten hours of semi-private lessons. I was totally thrilled and decided that I wanted to move to Phoenix, Az. 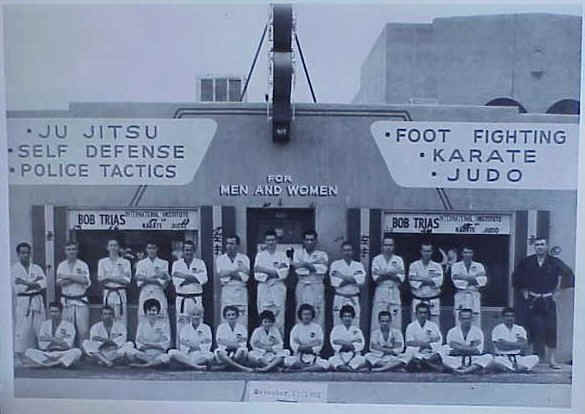 where Honbu Dojo was and train directly under him. Still awe-struck, still trying to figure out what ‘proper’ etiquette was, I spent 7 days a week 6-12 hours a day in the dojo, training, listening and enjoying the most incredible time in Shuri-Ryu history. One evening, a bunch of us went out to dinner. I rode with Sensei, as the dojo was kitty corner from my home. When we got home we started talking and I learned one very important lesson. All of a sudden Sensei told me that I was not just a valued student but one of his closest friends. Well I was shocked, I was a kid, a lowly kyu, a ‘girl’ and a very outspoken lesbian feminist… so how could this be? Then he told me. Well I was in tears by then, totally shocked and somehow knowing that I had just been given the most incredible gift. Throughout the years Trias Sensei was not always happy with how I interpreted his encouragement to find my own way, but he was always supportive. It was always possible for me to fall down and get back up again, just a little bit smarter and a little bit more able to cope with the obstacles that have sometimes blocked my path. On July 11th 1999, ten years after the death of this great man, Shuri stylists from all over the world found ways to honor Trias O-Sensei. In my dojo, Shuhari Dojo, we got together, I told stories, of which I have many of this incredible man and then each of us, individually dedicated and performed a kata to his memory. 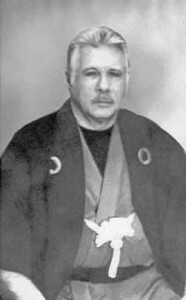 Trias Sensei gave so much to the martial arts world, creating the largest martial arts organization in the world at the time: the United States Karate Association (USKA). Don’t let the name fool you though, this organization was international with 33 member countries and at its peak 1 million members. He standardized the style known as Shuri-Ryu, creating a cohesive and comprehensive syllabus. He guaranteed a future for the style after his death by creating a loose enough structure for people to grow in and still enough structure for us to remain a cohesive and closely knit group. He appointed Chief and Assistant Chief Instructors to insure that there would be people to ask when Shuri stylists became unsure of technique, kata and philosophy. He instilled a wonder and love for the art that is passed on from teacher to student in all of the Shuri-Ryu dojos throughout the world. Trias Sensei gave me the tools and the opportunity to develop into the person I am, the person I want to be.